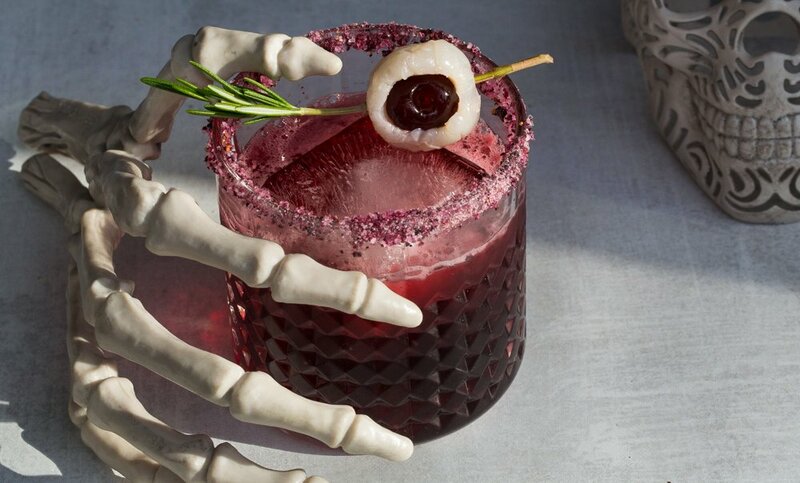 Freak out with this fun cocktail, made blood red with a delicious hibiscus simple syrup. We love using hibiscus because its delicious sour flavor enhances the margarita (no need for limes) and is packed with Vitamin C! A lychee stuffed with an Amarena cherry, speared with a rosemary skewer makes for a creepy cocktail indeed. Bring the ingredients to a rolling boil, then simmer for about 5-10 minutes. Taste it. The sweetness in the cocktail comes from the simple syrup, so it should be sweet — but not too sweet! Strain the simple syrup and allow to cool completely before using. Any extra keeps in your fridge for almost forever. Prepare a rocks glass by running a lime around the rim and coating it with the blueberry salt. Fill the glass with ice — or be fancy like us and use one king cube. Plop all the ingredients (minus the garnish) into a cocktail shaker with plenty of ice and shake, shake, shake your moneymaker. The more you shake, the yummier the drink. Using the strainer, pour the cocktail into the prepared glass. Garnish with freakiness, and enjoy.